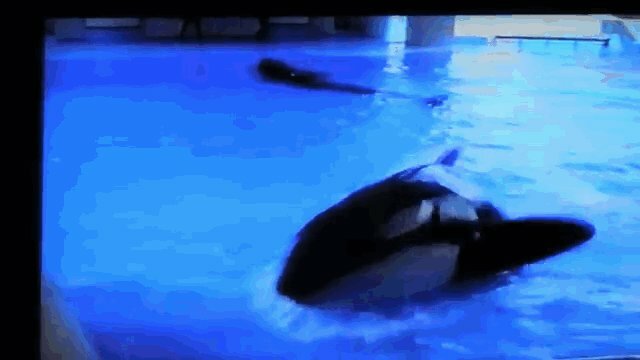 An old VHS tape shot 18 years ago by audience members at a SeaWorld orca show reveals disturbing behavior from one of the whales - and the clip is even more potent now, in light of recent backlash against the park stemming from the documentary "Blackfish." 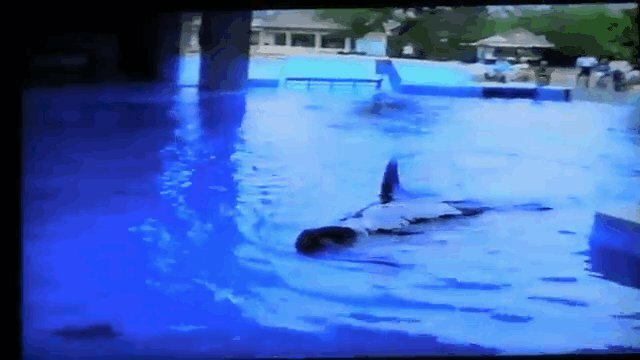 The clip, which can be seen in its entirety below, was shot in 1995 at SeaWorld's Ohio location, which closed in 2001. The orca featured prominently in the film is a female named "Kayla." At about 2:09 in the film, Kayla can be seen trying to haul herself out of the water onto a platform. The behavior is similar to that of wild orcas, who often beach themselves onto ice floes to grab prey. Around 2:30, she lunges up and onto a protective wall, then falls back into the water. At last, at 2:45, Kayla comes up and over the wall, her head so close to the audience members that they can (and do) reach out and touch her. With the recent publicity surrounding the danger that captive orca whales pose to their trainers coupled with the tragic death of senior trainer Dawn Brancheau in 2010, the video seems shocking - its ending could've gone very differently. Jeffrey Ventre, a former SeaWorld trainer, told The Dodo that this type of behavior was not unusual at the park. 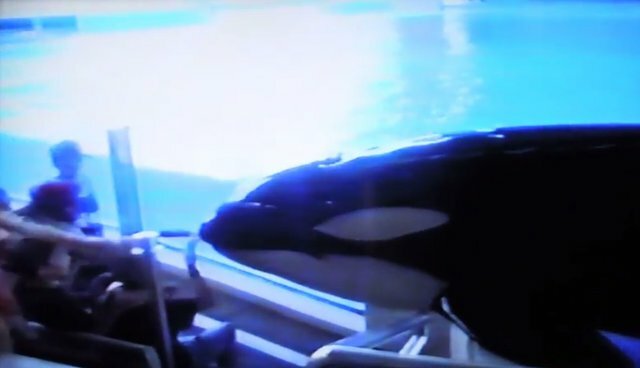 "This current video is of another bored and curious killer whale coming out of the water and making contact with park guests wanting to pet the 'happy Shamu,'" he said. The profile describes several other incidents, including one in which Kayla, who was separated from her mother at 11 months old, lunged at a trainer "with her mouth open, contacting him and throwing him several feet." Despite these incidents, Kayla, now 25 years old and living at SeaWorld Orlando, continued to work with trainers in her tank for years, until the practice was banned by the Occupational Safety and Health Administration (OSHA) in 2010. Ventre pointed out that behavior like this occurred in other whales - like Tilikum, the orca who killed Brancheau and was involved in the deaths of two other people. "I once filmed Tilikum coming out of the water, aggressively, at a very senior trainer at Shamu stadium, in the mid 1990's," he said, noting that Kayla and Tilikum's behavior are evidence that SeaWorld knew how dangerous captive orcas were before Brancheau's death. "In the heartbreaking case of Tilikum, he's managed to grab and kill 3 humans, out of boredom, curiosity or frustration. Based on this video, personal experiences, photographs, and knowledge that I have, it's probably very fortunate that a park guest hasn't been pulled in."